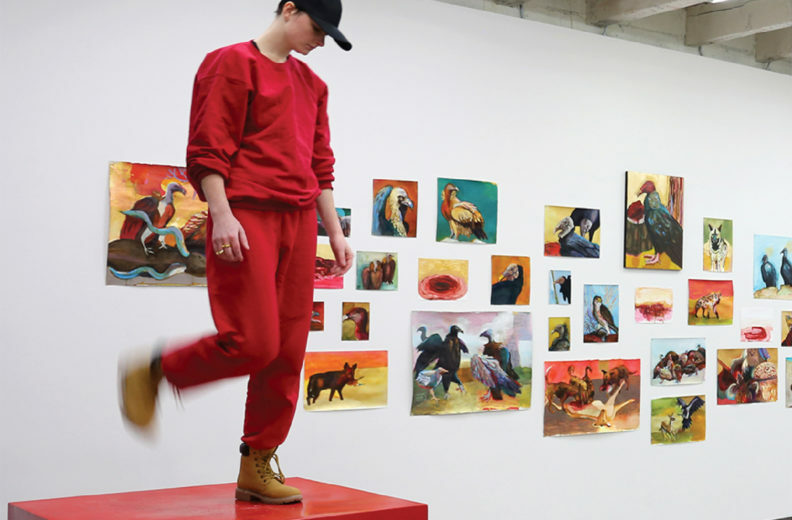 PULLMAN, Wash. – A gallery talk and performance art piece title “In Your Way,” with artist Kate Gilmore, will be presented 4:30-6:30 p.m. Thursday, Oct. 18, in the Bruce/Floyd and Borth Galleries at the WSU Jordan Schnitzer Museum of Art. Audience participation is encouraged and ear/eye protection is provided. Reception with light refreshments to follow. The presentation is free and open to the public. The “In Your Way” exhibition features 10 works — nine performance-based videos and one live performance/sculptural installation — by this New York-based artist. Gilmore is known for synthesizing multiple artistic mediums including performance, video, sculpture and painting. In her videos, she critiques and also inserts herself into male dominated movements such as Abstract Expressionism and Minimalism, exploring feminist themes and modern and contemporary art tropes, all the while exhibiting relentless determination. The spilling and splattering from her work are an ode to Abstract Expressionism or 1950s stripe paintings. Her works are mischievous and political, as well as humorous and critical of the heroic language and absence of women in these artistic movements. The physical situations and actions Gilmore creates for herself, and her performers are metaphors for challenges women face culturally and socially. Kate Gilmore was born in Washington, D.C., in 1975 and currently lives and works in New York City. Gilmore is trained as a sculptor, but began working in performance when she observed that studio visitors were interested in her process and materials as much as the work. She has had solo exhibitions at numerous institutions including Bryant Park/Public Art Fund, New York, Institute of Contemporary Art, Philadelphia, Parasol Unit, London, and Rose Art Museum, Brandeis University, Boston. Gilmore has participated in many acclaimed exhibitions including the “2010 Whitney Biennial,” Whitney Museum of American Art, New York; “Who’s Afraid of Performance Art?,” Fonds d’art contemporain de la Ville de Genève, Geneva; “Hothouse Video: Harder, Glorious,” Washington Project for the Arts, Washington, D.C.; and the “2011 Moscow Biennial,” Moscow. Her numerous awards include the Rome Prize (2007), Louis Comfort Tiffany Foundation Award (2009), Rauschenberg Residency Award (2013) and Art Prize (2015). For more information see the Jordan Schnitzer Museum of Art website.